Among the new features that most users envy of Google Pixel smartphones, is the ability to make gestures in the fingerprint sensor. A scroll, for example, with your finger from top to bottom, serves to access the drop-down notifications. 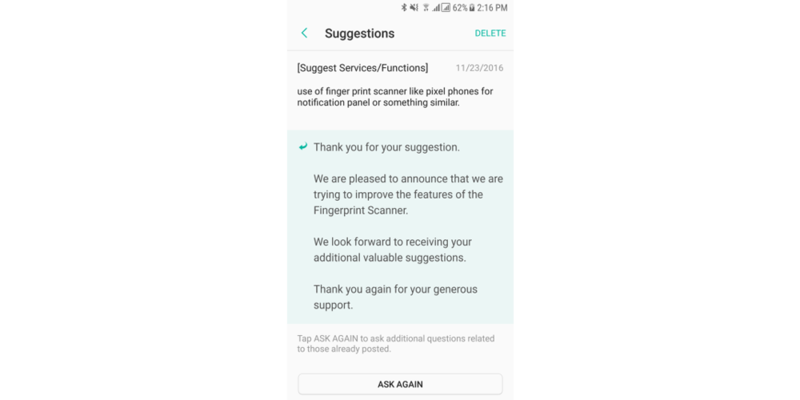 This feature is not exclusive to Google Pixel, also other cell phones, such as the new Honor 8, which can take advantage of this feature available in Android Nougat as well as Samsung devices that will receive update to Android 7.0 Nougat and have a fingerprints sensor. As you can see in the image below, Samsung manufacturer has provided a very clear answer to the Galaxy Beta Program members who had asked about the possibility of using the sensor as it happens in Google Pixel. This means that developers are working to implement this functionality even though at the moment they are not sure that it can be fully developed and tested due to the codes needed to recognize the gestures. We may know more about it once the new firmware beta based on Android 7.0 Nougat is released, as they do not usually release new features in the stable version without having been tested before. Anyway, this news will not influence the application of Samsung Pay, which the company intends to offer out-of-the-box in all its 2017 devices. That is, as of next year, would not only comply with the implementation of payment functions in all new terminals, but could use the fingerprint sensor to make the necessary gestures, and all this regardless of whether they belong to the top of the range or the entry level. This is basically the intention of Samsung Electronics, in order to ensure wide dissemination of its new card-less payment system.